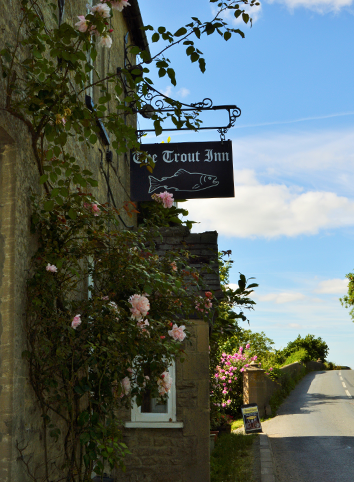 The Trout Inn has a separate bar called the Creel Bar which can be used to accommodate special functions, receptions, and parties for various occasions. The Creel Bar's seating capacity is increased by the use of a heated marquee that is also available during the summer and early autumn. In the marquee, we are able to seat up to sixty people formally for occasions such as business/private meetings, weddings and corporate functions, and can accommodate up to one hundred for more informal parties. We have a second marquee available, which is available to hire if you wish to increase the space for your party and we can supply you with the details of bands and solo artists who perform in many different genres that can provide entertainment for your function. We can provide barbecues or buffets for parties ranging from 30 – 100, if you decide on a barbecue, the food will be cooked over charcoal in our old railway forges. We like to be flexible with your function food and feel that the best way to do this is to discuss budgets and choices with you and produce a menu to suit. As well as our camping field we can provide you with details of local accommodation for you and your guests. We would like to advise that we cannot recommend anywhere in particular as we have not had reason to stay at any of the places. You and your party can also hire rowing or electric boats from Cotswold Boat Hire which operates during the summer season from our front lawn. We have garden and bar games available, and if you would like to try your hand at Aunt Sally or giant Jenga for example we have all the equipment available for you to have a go.